You may have already figured out by now that I love to read. I've always been this way. Growing up, I tried to read almost anything I could get my hands on. I was the girl in Walmart at midnight waiting for the new Harry Potter to be released...then would stay up the entire rest of the night reading all about his adventures. And while my genre choices have changed with age, my love for reading has never stopped. I'm the sort of person who when faced with a new problem or task that I don't know much about, I try to read every book I can about the topic so that I can learn more. It's why reading books about female entrepreneurs is my favorite topic of choice these days. 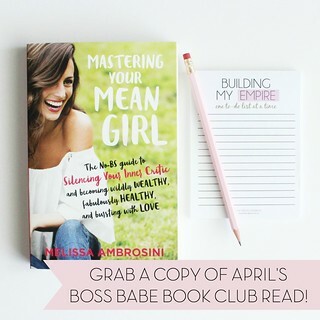 Heck, I've dedicated a whole book club to the topic. 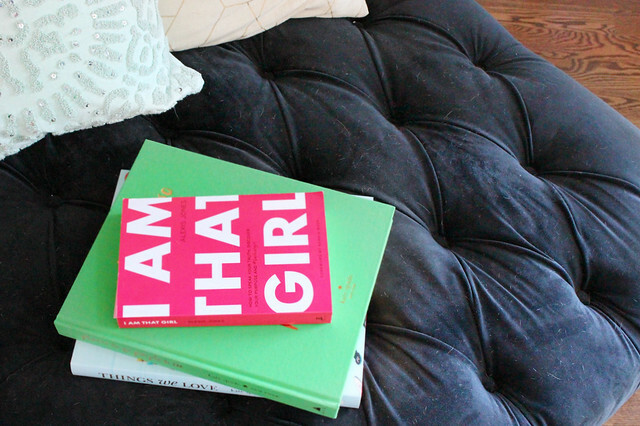 I'm currently reading I AM THAT GIRL by Alexis Jones. So it made perfect sense to me to create a cozy reading nook in my home for me to relax and get lost in the worlds and lives of other people. I can spend time with them, get to know them, and learn from them. Reading is a pretty powerful thing. It helps to both entertain and inform us at the same time...and often these two things don't tend to go together (example?...watch any reality TV). 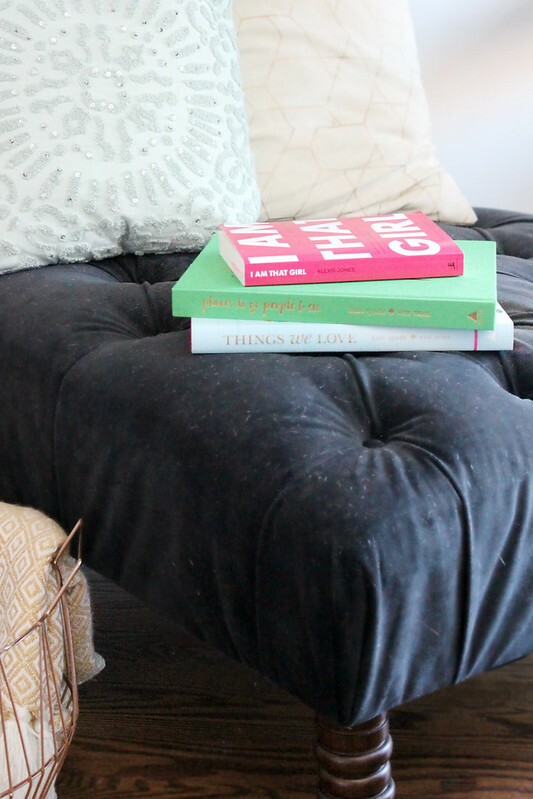 Yes, I could read on my bed or my couch. I often do. But I wanted a space that was dedicated to reading and feeling cozy. 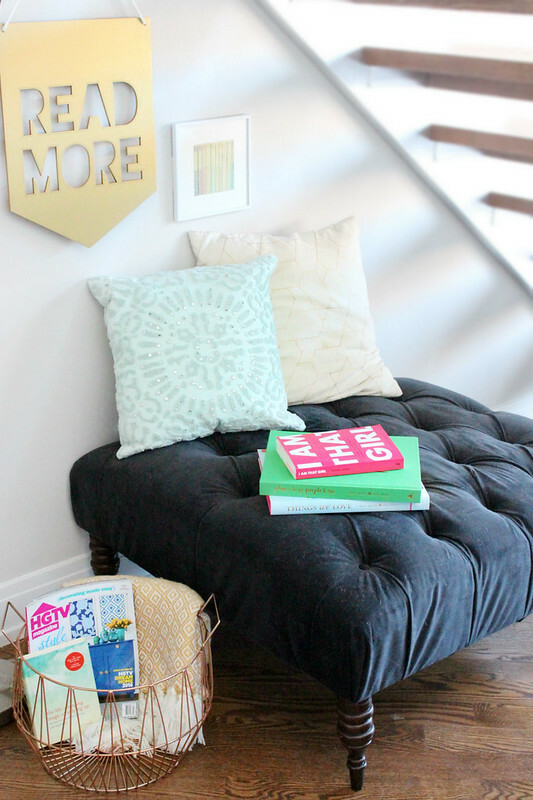 That's why I picked a comfortable tufted ottoman, cozy pillows, and a basket full of cuddly throw blankets to fill my reading nook with. I may have made it too cozy because my dog has sort of decided it's her own throne when I'm not home. 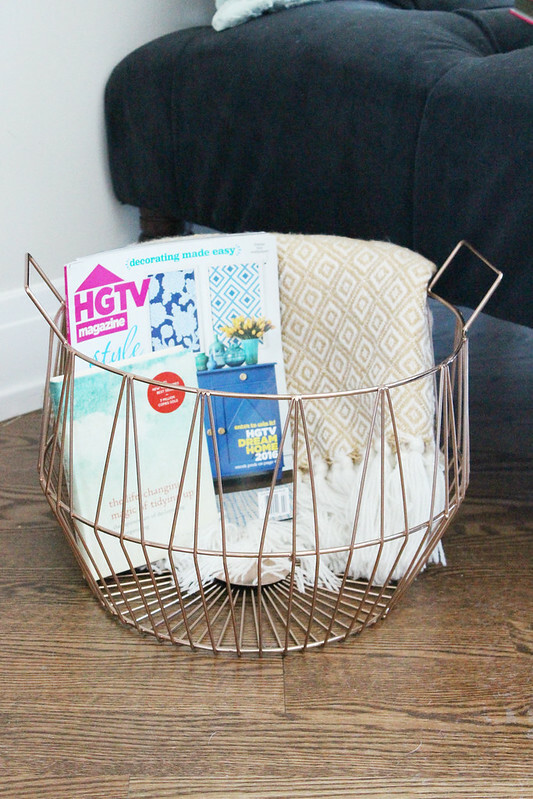 I wanted the nook to both serve as a cozy, inviting place that would encourage me to read more, as well as look perfectly chic as part of my living room. The decor used to make the nook had to be just right. 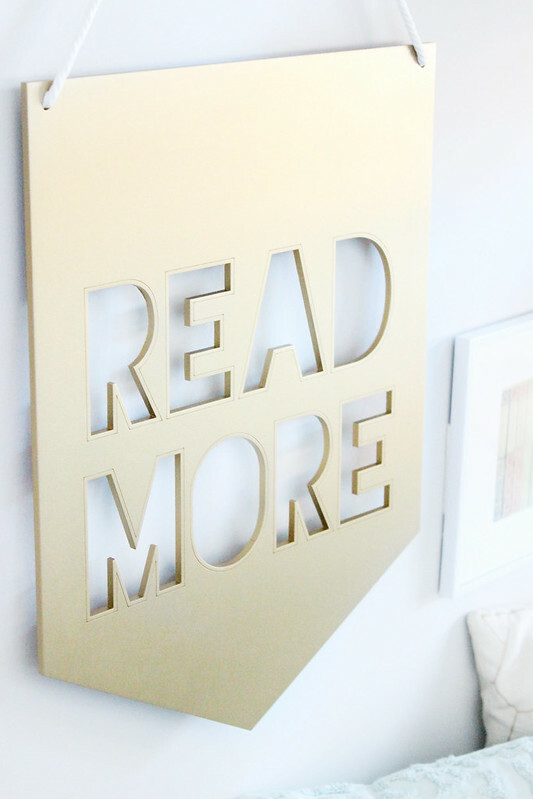 I commissioned this custom "READ MORE" wooden, metallic gold sign from an amazing Etsy seller, KOLORIZE. 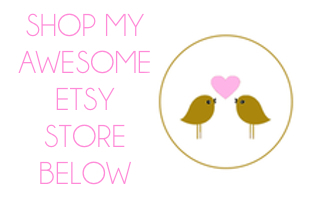 She had so many adorable pre-made quotes/designs, and her aesthetic was exactly what I was looking for in the space. She was able to easily make me a custom sign (I requested READ MORE), and I was able to pick from over 25 color choices. 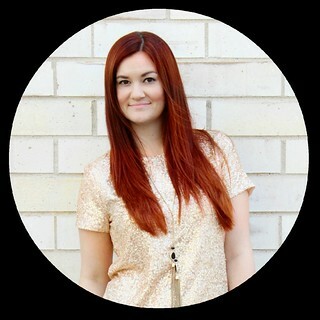 Naturally, I went with metallic gold. 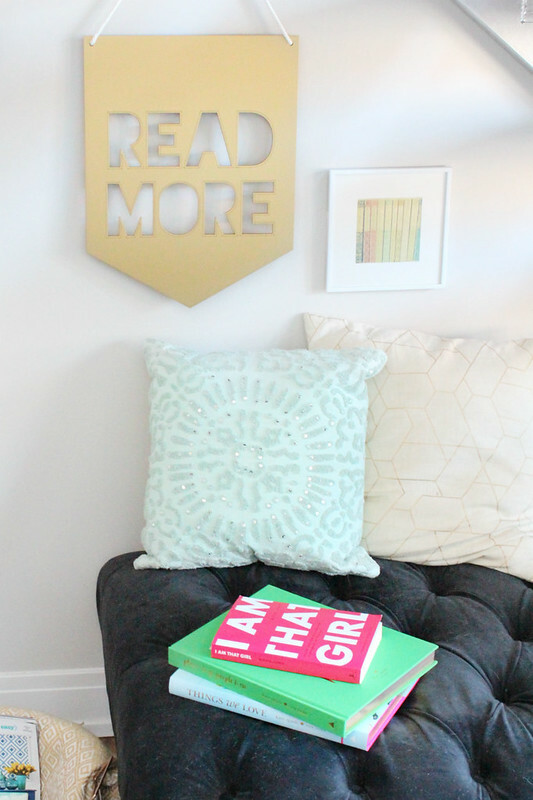 I loved the idea of having a sign that both looked chic and matched my decor, but also reminded me exactly what the little nook under the stairs was for....reading more. I believe it has done it's job. What are you currently reading? 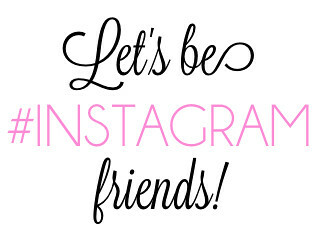 For more ideas, check out my DIY and Office Decor Pinterest Boards.